Wonderful vaseline art glass oil lamp with a blue drizzle threading by Gary Levi of the Levay Intaglio Art Glass Studio. This oil lamp is not signed. This art glass oil lamp measures approx. 4 inches high and 3-3/4 inches in diameter. PLEASE NOTE: The bottom on this one is quite smooth and round, so it tilts to one side when upright. In excellent condition, with no nicks, chips, or cracks. Another wonderful art glass creation from the late Gary Levi! You'll find more of the pieces I purchased from his estate auction featured below. 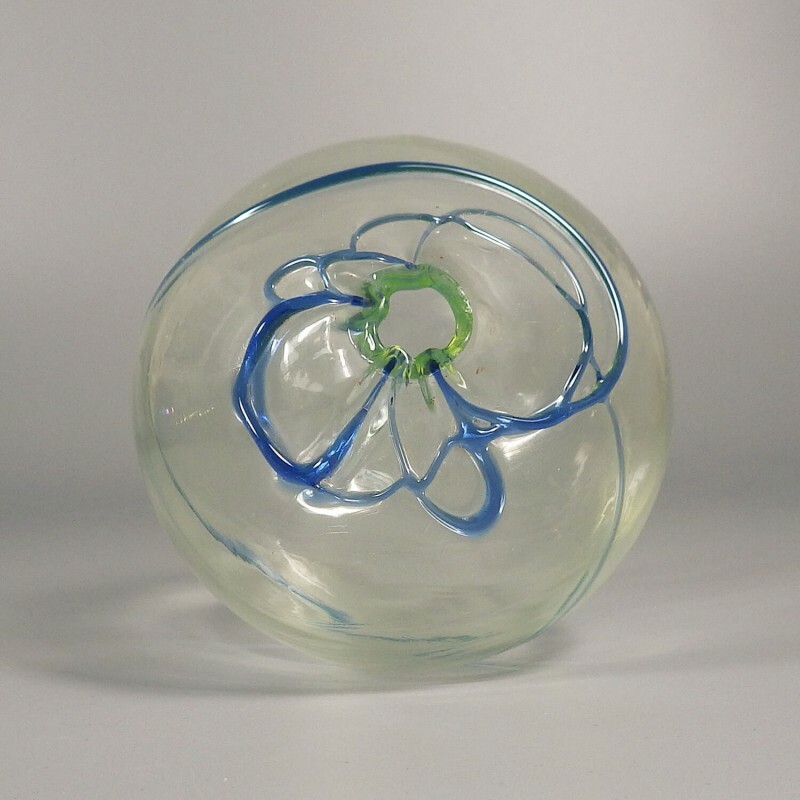 Here's another beautiful globe-style fire ball oil lamps from the late Gary Levi of Intaglio Art Glass Studio, with this oil lamp made from clear glass that has been decorated with a random drizzling of deep blue threading then finished with an icy white iridescent treatment. Dating to the mid 1990s, the concave base of this oil globe is signed with the Levi stylized punty logo signature. Measures approx. 3-3/4" in diameter and 3-3/4" high. 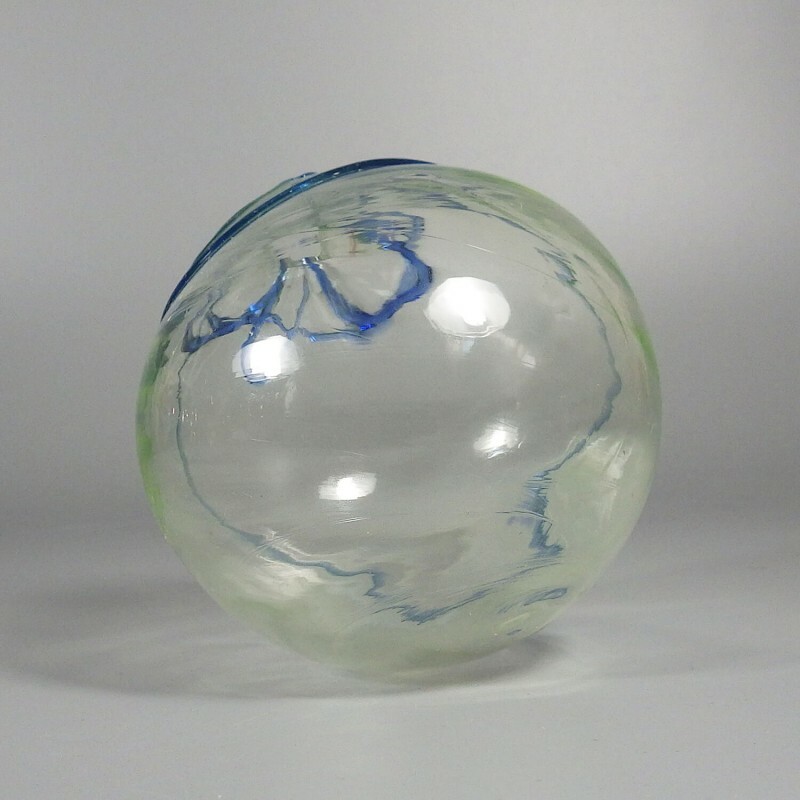 In excellent condition, the rai..
Hand blown art glass ball oil lamp from the late Gary Levi of Intaglio Art Glass Studio, this cobalt blue art glass oil lamp is decorated with a drizzling of creamy white threading and finished with a carnival iridescent treatment. The globe has a ribbed metal top with a wick; all you need is the oil. 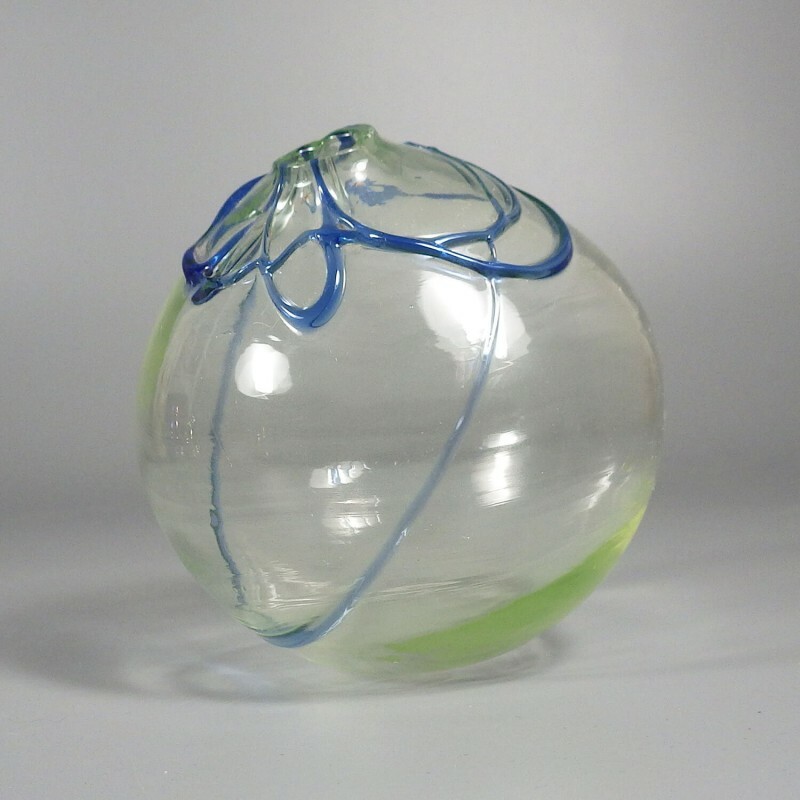 It is my understanding Fenton cullet was often purchased and used to make these glass creations.Glass globe measures approx. 3-1/2 inch high, 4 inch in diameter, and is signed w.. Signed threaded cobalt blue art glass oil lamp by Gary Levi of the Levay Intaglio Art Glass Studio, decorated with a drizzling of matching blue threading and finished with a carnival iridescent treatment. Measuring approx. 3-5/8 inch high and 3-3/4 inch in diameter, this lamp is signed with the stylized Levay Intaglio punty logo signature. In excellent condition, with no nicks, chips, or cracks.Another wonderful art glass creation from the late Gary Levi! 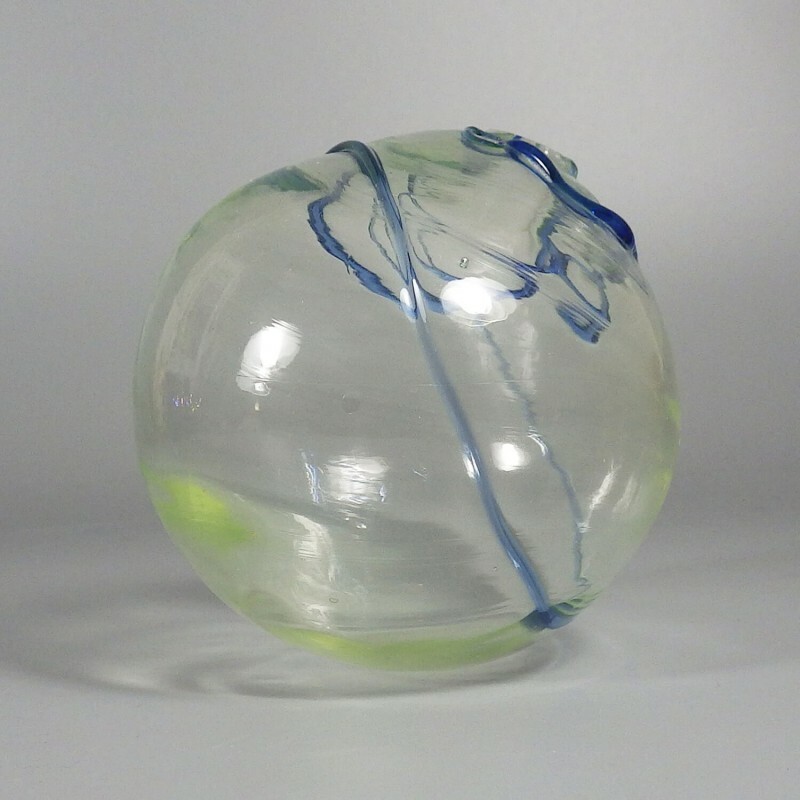 You'll find m..
Another threaded cobalt blue art glass oil lamp by Gary Levi of the Levay Intaglio Art Glass Studio, this one is not signed but is decorated with a light drizzling of white threading and finished with a carnival iridescent treatment. Measures just shy of 4 inches high and almost 4 inches in diameter. This art glass oil lamp is in excellent condition, with no nicks, chips, or cracks.Another wonderful art glass creation from the late Gary Levi! You'll find more of the pi..
For the less spacious room or corner, a miniature art glass oil lamp crafted in a transparent milky white glass and finished with a touch of blush pink iridescence. 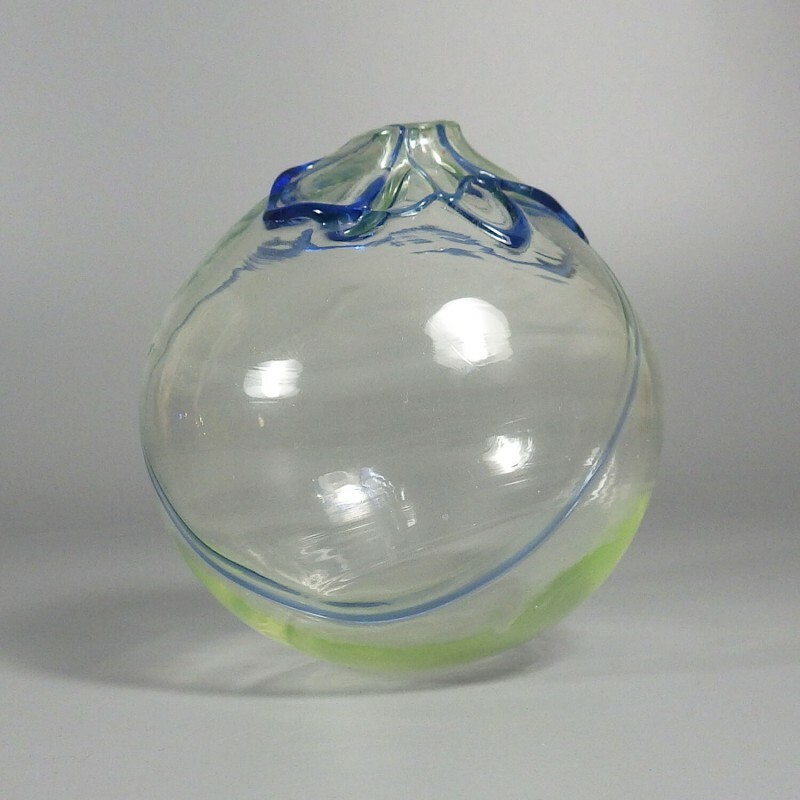 Created by Gary Levi and showing the Levay Intaglio Art Glass Studio stylized mark, this little glass oil lamp has a vertical rib design that inspires thoughts of a sea urchin.Measures approx. 2-5/8 inches high and 3 inches in diameter. This art glass oil lamp is marked with the Levay Intaglio Art Glass Studio sty..
Another threaded cobalt blue art glass oil lamp by Gary Levi of the Levay Intaglio Art Glass Studio, this one is not signed but is decorated with a light drizzling of white threading and finished with an iridescent treatment.Measures approx. 4 inches high and almost 4 inches in diameter. As this is hand blown with the drizzle treatment applied, there is a bit of an indent near the top, presumably due to the weight of the drizzle. Otherwise, in excellent condition, with no nic.. Signed light pink iridescent art glass oil lamp by Gary Levi of the Levay Intaglio Art Glass Studio. Given the vertical spine-like strips, I'm speculating the glass itself has a tinge of pink in it, with the iridescent treatment then an added finish, but it's possible it's actually clear glass with a pink iridescent finish.Measures just shy of 4 inches high and almost 4 inches in diameter. There is a white spec inclusion of some sort in the side of the globe, but otherwise th..
Another unsigned threaded cobalt blue art glass oil lamp by Gary Levi of the Levay Intaglio Art Glass Studio, decorated with a light drizzling of white threading and finished with a carnival iridescent treatment.Measures approx. 4 inches high and almost 4 inches in diameter. 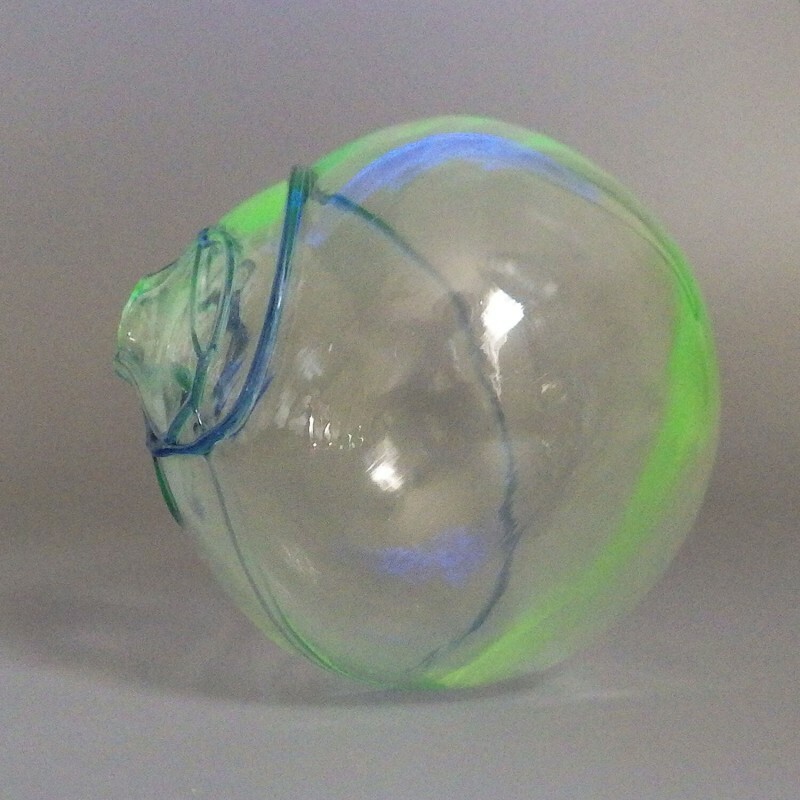 This art glass oil lamp is in great condition, with no obvious nicks, chips, or cracks. There is one or two points where the drizzle overlaps and either ends at that point or the top layer later lifted.An..